When I was a child living in a poor rural area of New York State there was no possibility of personally owning a camera. My mother and aunts had a series of inexpensive Kodak cameras and used them primarily to record family events like holidays and vacations. Most of the photographs they took were made in black and white until the late 1960s because of cost. I was occasionally allowed to take photos, but the occasions were truly rare because of the cost of film and processing. In 1970 I acquired my first camera, a Canon SLR, at a pawn shop near the small college I was attending. The SLR was for use in a Photography 101 class. We were instructed to shoot black and white only, have our negatives processed locally, then once a week we had the run of the darkrooms at the Rochester Institute of Technology, where we printed from our negatives. I came away from the class with a vague understanding of the relationship between aperture, shutter speed, metering, and film speed, and a positive appreciation of the joys of making photographs and printing in the darkroom. I have to admit though, that I learned as much about my lovely lab partner as I did about photography, something I don’t necessarily regret. In later years I traded the SLR for a typewriter and bought a Canon AE-1. I shot at a somewhat slow rate and only had about half of the rolls processed, depending on the subject matter and whether I had the extra money for processing (I had a young family and it seemed that there was a near-constant vacuum at work, sucking the money out of my wallet). Sometime around 1999, the AE-1 was stolen while out on loan (and I want to personally thank the thief for his courtesy, now). I occasionally used my wife Lisa’s point and shoots and 35mm disposable cameras, until a couple years later when she surprised me with a Kodak DC3400, an early digital camera. I loved the way that the Kodak rendered color and took the camera with me on many long motorcycle rides. I still think that camera did a better job with color than the more advanced digitals I later acquired. In 2006, using my 55th birthday as an excuse, I arranged to ride my motorcycle from Southern California to Long Island where my daughter was attending University, and up to the Finger Lakes area where I grew up, then back to Southern California. Again, just before I left Lisa surprised me with a Panasonic Lumix DMC-FX01, a point-and-shoot digital that was considerably more advanced than the Kodak and had anti-shake technology that allowed me to shoot “from the saddle” while riding the motorcycle. The digital cameras allowed me to bring home scenes I captured during my long motorcycle rides, which often lasted several days, scenes that I wanted to show to Lisa, who doesn’t enjoy long motorcycle rides. Later, wanting more control of my digital photographs, I bought a Nikon D200. The D200 was and still is an excellent camera and it allowed me the additional control over my photos that I was looking for, and not finding with the compact cameras, but there was still an indefinable “something” missing. After a few months, I realized that I missed the feel of working with an SLR. I missed the process of film photography. I decided that since it wasn’t nearly as expensive as investing in another DSLR, I would pick up a SLR and shoot some film, again. I did a bit of research on the Web then bought a Nikon SLR partially because I had a couple lenses for it. The camera was a Nikon N90s. I was amazed by the $70 price for an excellent condition body. I then bought a few rolls of color film locally (trustworthy film was still available in numerous stores at the time). When I went out to shoot the camera the first time, it was Nirvana. I absolutely loved it. I had forgotten about the tactile feel of loading a roll of film into a camera, the whir of it moving through the camera body, the pleasing sound of the shutter, and the very familiar feel of operating a manual focus prime lens. I also re-experienced the anticipation of waiting for the film to be developed and the relatively careful approach to shooting that is a side effect of the cost-per-frame of film photography. I quickly noticed that because I slowed myself down to shoot film, I was getting a much larger number of “keepers” from a 36-frame roll than any sequence of 36 frames I typically shot with a digital camera. And I was enjoying the “analogue” process more than shooting digital. I still shoot digital when the situation is right, but I’m leaning progressively more in the direction of film photography. Film photography is a different animal than digital, a different approach, a different process. It is an excellent situation that we’re in at this time in history, because we have a wider choice of photographic mediums than we had a decade and a half ago. It is always nice to have a choice. I find it interesting there seems to be a growing resurgence of film photography after the early doldrums of the digital age, despite the overabundance of “Film Is Dead” (FID) articles. The FID articles are the result of lazy writers. Writers who lack original ideas. FID, as is often said, is a load of crap. Film will be with us as long as we keep buying it. Nowadays when I’m heading out to shoot and considering what camera or cameras to pack into the motorcycle’s saddlebags, I’m nearly always choosing from my small pool of film cameras. Do I want to shoot medium format or 35mm? Yashica TLR, Nikon SLR, or Yashica Rangefinder? Black and white or color or both? The color 35mm film goes to a reliable local 1-hour processor. The black and white 35mm and 120 film gets developed at home. The color 120 and 220 is processed by a pro lab. All film is scanned at home, since the Web is my target output. I hadn’t given much thought to being an artist until a friend called me that a few months ago. My approach to photography ignored the idea of the artist because it wasn’t relevant to me. I may be an artist, but I put little focus on it. I simply enjoy the process of photography, particularly the film process. Some of my photos are what I consider “good” or “fair”. Others are simply handy “illustrations” to augment something I write. Yet others are “documentary”, such as family photographs. I have been a writer since grade school. In the 1970s, 80s, and 90s I was frequently published in small press, literary, and poetry magazines. I was in the printing industry for 23 years, owning a small commercial print shop at the end. When it became obvious to me that widespread computerization was going to ruin the printing business for those who were not heavily capitalized, I sold my business and took a year’s teaching contract as a transition to contract Technical Writing. I enjoy technical writing, but also entertain myself by writing this blog about “Photography, Motorcycling, and In Between”. It allows me a forum to write whatever I want. It is somewhat whimsical. But it is also the perfect place for an admittedly tenuous balance between photography and writing. 35mm and Medium format film. M4/3 and APS-C digital. I use 35mm film primarily for landscapes. The cameras don’t take up too much space in my saddlebags, so I can take a couple on a ride and still have room for essentials like my phone, thermos of coffee, and extra clothing. The equipment, bodies and lenses, are widely available and relatively inexpensive. I have around $200 invested in my main “Full Frame” outfit, the Nikon N90s with a 28mm prime lens. Compare that to a basic digital full frame outfit that would conservatively cost $4,000 to $5,000. 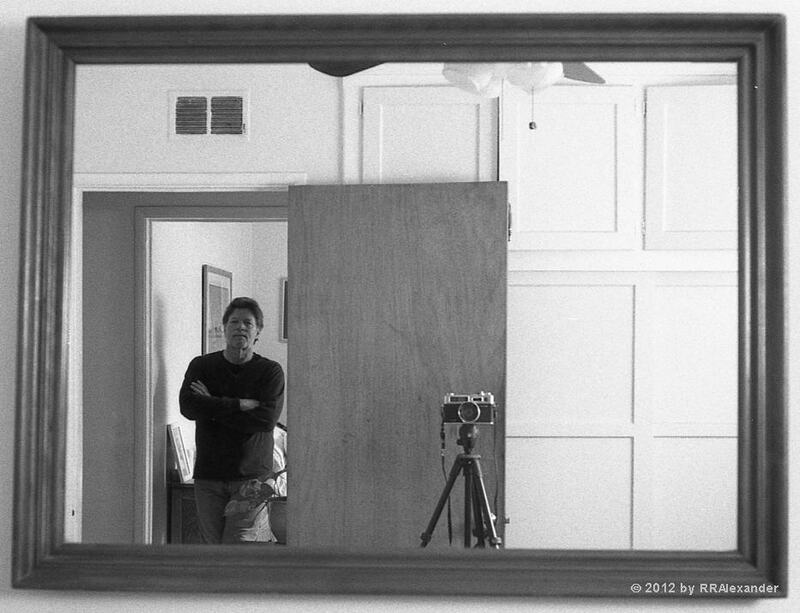 I can shoot a lot of film for the difference in price of a few thousand dollars, and I enjoy shooting film more. It is a no-brainer for me. I use 120 and 220 in the Yashica Mat 124 TLR. The Mat is a highly enjoyable camera, probably because it is so fundamental. 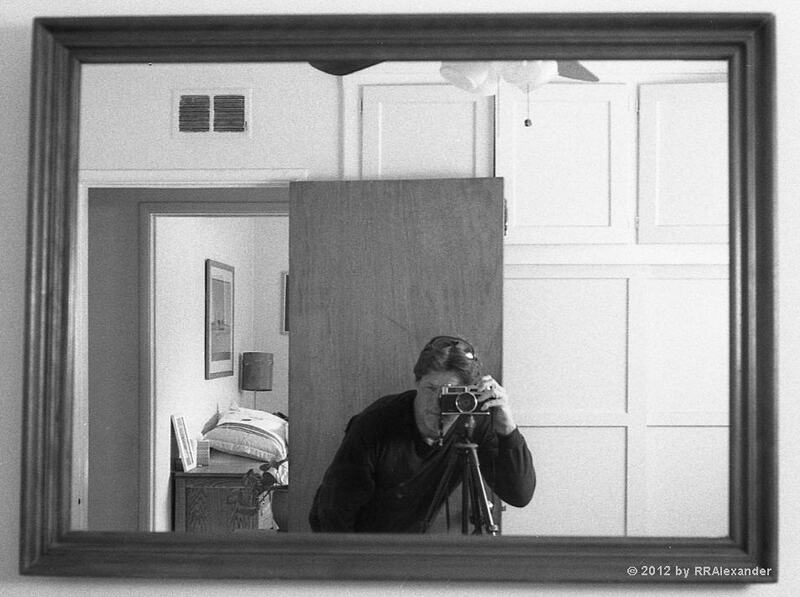 Like so many other examples of that camera, the selenium light meter went south some time ago, so I’m the light meter. I use the Sunny 16 system to judge the lighting conditions, which works out surprisingly well. I like the relatively big, beautiful negatives, which scan quite well. I use it for shooting urban scenes, motorcycles, classic cars, and when loaded with color 220, landscapes. The M 4/3 digital fills in the gaps. I shoot family photos, sunrises, and product photos when I want an image of a film camera, etc., for the blog. The APS-C digital camera is in my son’s hands 95% of the time. It is the right tool for capturing photos of my grandson’s motocross racing. In case anyone wanna know, the camera he took these self portraits with ended up in my hands. Now i have something to remember him by.